Covers the Burgundy Wine Regions of Chablis, Cote de Nuits, Cote de Beaune, and Cote Chalonnaise. Burgundiae Inferioris Quae Ducatus Nomine Censetur, Des. A stunning first edition first state example of the 1584 first edition of Ortelius' classic map of Burgundy, France. 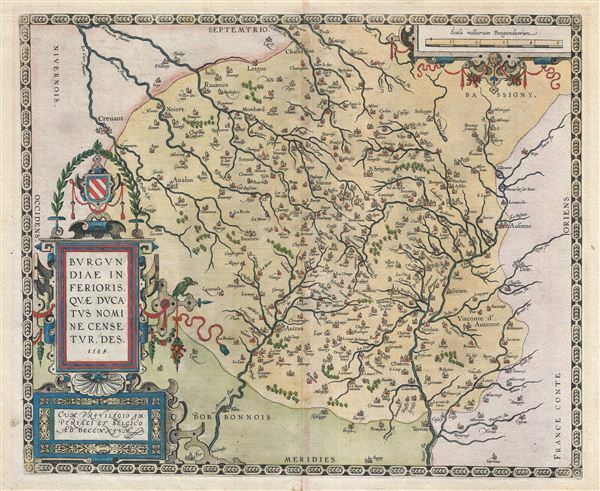 Although Ortelius references this region as 'Burgindiae Inferioris' or Lower Burgundy, it specifically covers those areas which are today most commonly associated with the production of Burgundy Wine - arguably the finest French wine. The Burgundy wine regions included on this map include four of the five primary divisions: Chablis, Cote de Nuits, Cote de Beaune, and Cote Chalonnaise. Maconnais, the fifth, is just a little further to the south along the Saone River. It also includes the cities of Avalon, Auttun, Chalons, Beaulne, Verdun, and Chastillon, among many others. Ortelius printed approximately 100 copies of this map before making minor changes for a second printing. Over the course of this map's entire run, approximately 5050 were printed in for various versions of the Theatrum, though only one state exists. It is impossible to know how many have survived the subsequent centuries. Ortelius, A., Theatrum Orbis Terrarum, (Amsterdam) 1584. Very good. Original pressmark visible. Latin text on verso. Old tape on verso, at margins, due to previous framing. Minor repaired centerfold split limited to lower margin. Van den Broecke, Ort 54 (Koeman/Meurer: 96, Karrow: 1/142, van der Krogt AN: 4870:31A).